I had the privileged of spending some time with beekeeper Chris Hewitt yesterday. Chris is in his 9th year of beekeeping, and one of 13 beekeepers in the United States Department of Agriculture (USDA) Russian Breeders program. I have ordered two nucs from him for my Langstroth hives, and he invited me to visit his home apiary. We spoke and toured his house and yard for over two hours, and with his permission I thought I would share some of the highlights. Yesterday was quite cold for Virginia, with bees everywhere huddled in their clusters. I met Chris and his wife Marjorie at their home less than 2 miles (as the bee flies) from my house. Majorie has been making soaps for more than 30 years, though she now has a ready supply of beeswax and honey. Their Soap & Honey Company sells her soap as well as Chris’ bees and honey. Chris recently became a qualified breeder in the USDA program, after a three year certification period. The program was conceived in the early 1990’s to evaluate queens from the Primorsky Krai region of Russia for their resistance to the varroa mite. This region is next to China and has been dealing with varroa mites much longer than the rest of the world. After a six month quarantine of 100 queens on an isolated island off Baton Rouge, Louisiana, followed by an additional testing period, six breeding lines were released in 1999 to U.S. beekeepers. Additional queens were imported and additional breeding lines have since been released, and the USDA keeps a close eye on the genetic lines to avoid inbreeding. I think Chris said that 17 lines now exist. Chris oversees two genetic lines as part of the program. When I mentioned that some people say Russians are harder to manage than other bees, Chris pointed out that these bees are really just Caucasian bees. Both bee races are Apis mellifera caucasia. The Caucasian bees were brought to North America from Russian around 1905, well before varroa mites became a worldwide problem. What we call Russian bees were brought over more recently, and the lineage between Caucasian and Russian bees is probably unknowingly blurred in many bee yards. Russian bees have been shown to exhibit a number of resistant traits. Varroa Sensitive Grooming, or VSG, is the tendency of some bees to bite or otherwise damage mites. Some people call these “ankle biters” because the bees bite the mite’s legs off. The bees will also detect mites in brood cells, and uncap these cells to eliminate the mites, something called Varroa Sensitive Hygiene, or VSH. The tendency of Russian (and Caucasian) bees to stop laying brood during a nectar dearth and over the winter also reduces the ability of mites to reproduce. Under the program, Chris’ queens mate with drones from other breeder lines. The breeders share queens with each other and set up drone production hives. Drone frames are then distributed to other hives in an attempt to flood mating areas with drones from specific lines to preserve and advance the genetic stock. Part of the USDA monitoring is to insure that each lines’ genetics remain relatively pure. Though it appears a couple years out of date, more information is available at the Russian Honeybee Breeder web site; or see a summary of the program’s history at the USDA web site. As a Russian bee breeder, Chris is expected to produce and distribute his queens to the public, and boy does he ever. He maintains two hives stuffed with too many bees and primed to swarm. Each hive is inspected top to bottom twice a week to remove excess comb and any rogue queen cells. After one or two inspections the bees really hate him, Chris says, as he forces the entire hive to go through a queen excluded to guarantee that no virgin queens are present. Chris grafts and raises 45 new queens in these hives each week from April through June, over 800 queens year round. From these he maintains his own hives and sells both starter colonies (nucs) and queens. An image of Chris’ yard, showing his mating nucs in the foreground. From here his queens make their mating flights before being moved to a more permanent hive. Chris keeps detailed records and has recorded an over 80% success rate from initial grafting of an egg to a productive laying queen. Chris makes most of his own equipment in a small wood shop in his basement. 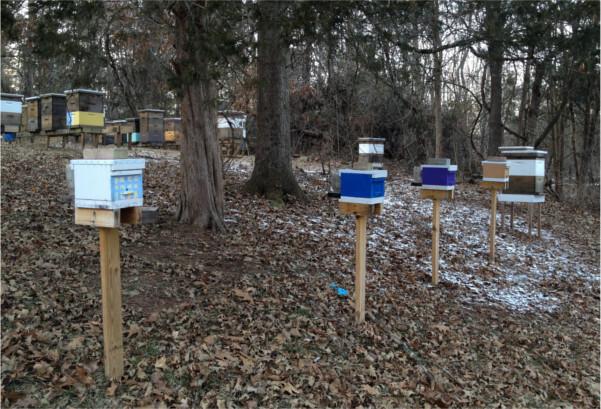 In addition to standard deep and medium Langstroth boxes, he creates small mating nucs for his virgin queens. A picture of these, now empty of course, is shown here in his back yard. To my concerns about having bees, Chris says not to worry. He selects for gentle bees that produce well and overwinter with little or no treatments. He has such a large business, so he does use formic acid late in the summer and oxalic acid over the winter to protect his production hives against mite issues. These chemicals get nowhere near his breeder hives, of course. I’m still not sure how I’ll handle this issue, but it is nice to know I’ll have bees bred as part of a program working to do away with chemical treatments. I wonder how effective the grooming is. It sounds to me like it is one weapon in the arsenal against mites, but most effective combined with other treatments as Chris does. The Asian bees which have evolved with the mites (Apis cerana) tend to have smaller colonies and swarm more often, leading to frequent natural breaks in the brood cycle that prevent varroa from breeding. Yes, I wonder that too, Emily. It clearly helps, and I’ve read that some beekeepers artificially split hives or cage queens to force a break in the brood cycle for just this reason. Doing this along with hygienic bees allows them to be treatment free and reduce any losses. There are a number of beekeepers in my area, so controlling the gene pool would be difficult in my case. What a privilege to spend time with an experienced beekeeper like Chris. I haven’t heard much about Russian bees either, so it was very interesting to hear about their higher resistance to mites. I agree, Emma. It was very generous of him. I’m looking forward to having his bees and seeing them in action. I’ll keep you posted….